Security teams today are compelled to make fast, and accurate decisions about which threats present the highest risk to their organization, and how to defend against them. As attacks and attackers continue to evolve, security professionals have the opportunity to leverage breadcrumbs from DNS and Domain data to craft an active defense. In this webinar, Robert M. Lee of Dragos Security LLC provided a thorough analysis of BlackEnergy 2/3 while Tim Helming of DomainTools walked through why adversary analysis matters, and how to triage indicators and asses threats. 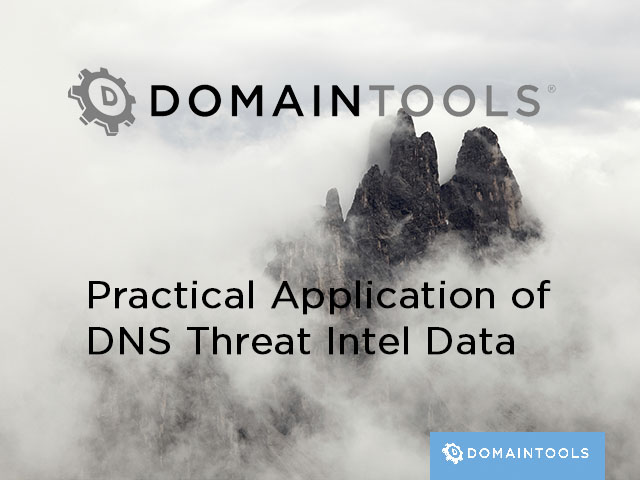 Ways to better defend against attacks and data exfiltration using DNS and large-scale threat intelligence. Robert M. Lee is the CEO and Founder of the critical infrastructure cyber security company Dragos Security LLC where he has a passion for control system traffic analysis, incident response, and threat intelligence research. He is a SANS Certified Instructor and the course author of a multitude of SANS courses. Robert is also a non-resident National Cyber Security Fellow at New America focusing on policy issues relating to the cyber security of critical infrastructure and a PhD candidate at Kings College London. For his research and focus areas, he was named one of Passcode's Influencers, awarded EnergySec's 2015 Cyber Security Professional of the Year, and named to the 2016 Forbes' 30 Under 30 list. Phishing and other cybercrime campaigns often use deceptive domain names to accomplish their nefarious goals. These look alike domains can allow criminals to pose as employees or partners by spoofing email addresses, or to create deceptive links for the victim to click on. Phishing is the most often-used vector in successful data breaches; it targets an organization’s employees, its customers, or the world at large, with alarming effectiveness. Fake website and phishing scams cost the average-sized organization nearly $4 million annually. Prevention is key and starts with monitoring the Internet for “phishy” domain name registrations. Prior to the release of PhishEye, phishing domain searching was typically available only via custom tools built by security teams themselves. PhishEye automates this painful manual process by showing you existing and new domains that spoof legitimate brand, product, organization, or other names, so that you can carry out defensive or investigative actions against them. The Kill Chain model is a useful way to understand how adversaries are able to compromise their victims. During the earliest stages of preparation for an attack, the reconnaissance phase, attackers have not yet breached the victim environment, but they are, in fact, leaving subtle clues behind. These clues can be detected and enriched to help an organization prepare defenses ahead of the first directly invasive move by the adversary. Michael has worked as a security analyst in various sectors including the Financial, Federal Government, and Defense industries. He has an undergraduate degree in Computer Engineering from the University of Dayton, an MS in Computer Science from The George Washington University, has received a variety of industry certifications including SANS GCIA, GREM, and GCFA, and is a SANS Forensics and IR blog contributor. Michael's past speaking engagements include the DC3 Cybercrime Conference, IEEE, and SANS amongst various others. Most analysts or threat hunters who have multiple investigations under their belts are familiar with frustrating dead ends, or lengthy time investments. However, new tools and techniques are making it easier to establish “quick wins” that pay off in helping defend your organization. It has been said that there are two types of companies: those who have discovered they have been breached, and those who have not discovered it yet. Although unsettling, this rationale is conducive to constructing a healthy attitude towards your organization’s’ security practices. This hour long webinar will help guide your security process to protect your organization’s most valuable assets by applying the scientific method—specifically, forming and testing hypotheses about potential incursions, and then acting upon the results. When it comes to threat hunting, incident response, and other related activities, some sources of analysis and data are critical. Two of these are malware analysis and adversary infrastructure mapping. Each discipline is valuable on its own, but when combined, they can give your team extraordinary advantages in containing or blocking aggressive threat actors. Join SANS forensic expert Alissa Torres and DomainTools Director of Product Management Tim Helming to learn more about how you can apply these techniques to your own hunting, IR, and prevention strategies. Alissa Torres is a SANS analyst and certified SANS instructor specializing in advanced computer forensics and incident response (IR). She has extensive experience in information security in the government, academic and corporate environments. Alissa has served as an incident handler and as a digital forensic investigator on an internal security team. She has taught at the Defense Cyber Investigations Training Academy (DCITA), delivering IR and network basics to security professionals entering the forensics community. A GIAC Certified Forensic Analyst (GCFA), Alissa holds the GCFE, GPEN, CISSP, EnCE, CFCE, MCT and CTT+ certifications.